Ananda Fuara means the “Fountain of Delight,” a name given to us by spiritual teacher Sri Chinmoy. Because of his inspiration, we strive to offer our customers delicious food that satisfies both inwardly and outwardly, combined with a peaceful atmosphere. All of our food is 100% vegetarian, organic where possible, and often vegan. Just let us know if you have any special requests. Two thick slices of our famous neatloaf, made from grains, eggs, ricotta cheese, tofu and spices, blended together and baked. Topped with our tangy tomato-based sauce. Vegan upon request. Vegetarian chicken chunks with homemade pesto, mozzarella cheese, fresh baby spinach and tomatoes in a yellow chipotle tortilla. Vegan upon request. A yellow chipotle tortilla filled with sauteed portobello and melted cheese, with a side of salsa. Vegan upon request. Vegan cheese can be substituted for no additional charge. 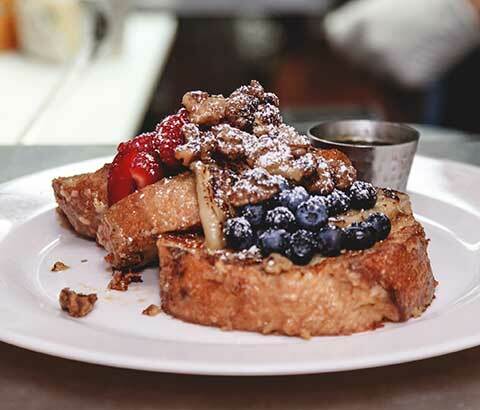 Orange Blossom Berry French Toast: french bread dipped in orange batter with caramelized bananas, fresh strawberries, blueberries, raspberries, and glazed walnuts on top. Served with pure maple syrup. 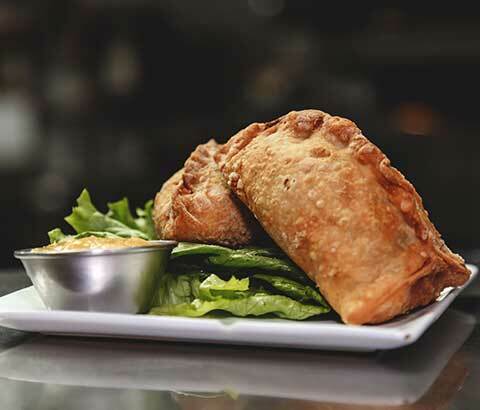 Two delicious fried pastries filled with potato pea curry and served with the chutney of the day. Vegan. Two poached eggs and spinach, wild mushrooms, caramelized onions, white truffle oil, and topped with Hollandaise sauce on an english muffin. Served with potatoes. Available from 11:00 a.m. to 3:00 p.m., Tuesday — Friday. Sesame Herb, Lemon Tahini, Dijon Vinaigrette, Honey Mustard, Bleu Cheese, and Oil & Vinegar. Dinner salads are made of organic mixed greens, red leaf lettuce, carrots, cucumbers and beets. Grilled tofu, veggie chicken chunks, carnitas, pollo verde, spicy chicken, or Thai chicken for $3 more. Our dinner salad paired with a cup of dal ( a spicy indian lentil soup) or the soup of the day. Substitute a bowl of soup for $1.00 more. Vegan if soup of the day is vegan. Dinner salad or cup of soup or dal shares a plate with one slice of neatloaf and our tangy neatloaf sauce. Vegan upon request. 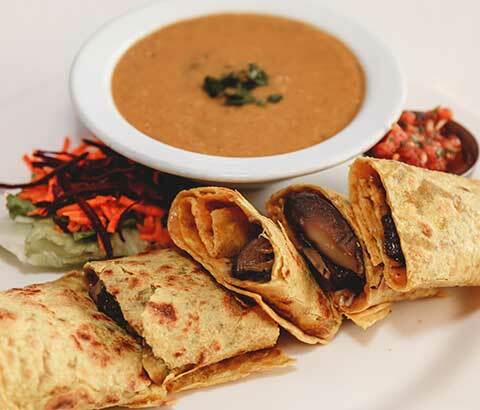 Enjoy a samosa and the chutney of the day with a dinner salad or cup of soup or dal. Vegan if soup of the day is vegan. A cup of basmati rice topped with the curry of the day shares a plate with a dinner salad or cup of soup or dal. Vegan if curry of the day is vegan. A yellow chipotle tortilla folded over sauteed portobello mushrooms, cheddar cheese, and salsa, along with a dinner salad or cup of soup or dal. Black beans, brown or basmati rice and a dinner salad. Add a cup of soup or dal for only 4.95 more. Vegan. Two of your choice of either veggie carne asada, pollo verde, or portobello mushrooms on organic soft corn tortillas with beans and salsa. Served with your choice or either a dinner salad, soup of the day or dal. Vegan. Marinated kale, quinoa, black beans, tomatoes, red onion, edamame, roasted pumpkin seeds and avocado. Add a cup of soup or dal for only 4.95 more. Vegan. Simple but amazing! Marinated kale, quinoa, topped with dal and one piece of naan. Vegan. Marinated kale, quinoa, black beans, guacamole, salsa, sour cream, and sharp cheddar. Add a cup of soup or dal for only 4.95 more. Vegan upon request. Marinated kale, croutons, veggie chicken breast, vegan parmesan. Add a cup of soup or dal for only 4.95 more. Marinated kale, glass noodles, edamame, carrots, beets, peanut ginger sauce and veggie Thai chicken. Add a cup of soup or dal for only 4.95 more. 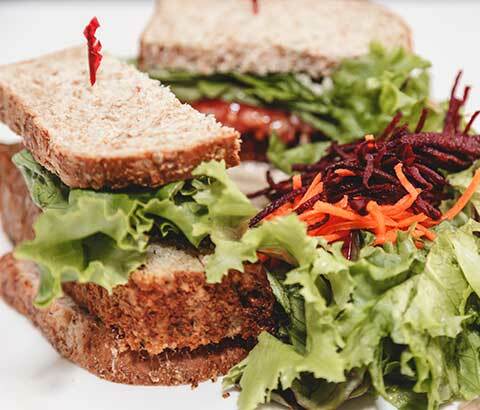 All sandwiches are served on vegan whole wheat seeded bread (unless otherwise noted) and include lettuce, tomato and our vegan mayo. They also include the garnish of the day or a small green salad with your choice of dressing: Lemon Tahini, Sesame Herb, Dijon Vinaigrette, Honey Mustard, Bleu Cheese, Olive Oil and Balsamic Vinegar. Add cheddar, mozzarella, pepperjack, or vegan cheese for $1.50. Our best seller! Two thick slices of our famous neatloaf, made from grains, eggs, ricotta cheese, tofu and spices, blended together and baked. Topped with our tangy tomato-based sauce. Vegan upon request. Our award-winning burger — a blend of fresh vegetables, sesame seeds, grains and selected herbs, topped with grilled onions and served on a 9-grain sprouted organic bun. Vegan. Strict vegans please ask for ciabatta bread as the sprouted breads have a small amount of honey. Veggie chicken with our vegan mayo, sweet relish, celery, parsley, and red bell peppers on ciabatta bread. Vegan. Veggie bacon, avocado, lettuce and tomato, and our vegan mayo on ciabatta bread with your choice of a small green salad or garnish of the day. BBQ glazed Impossible Burger topped with lettuce, tomato, pickles, and onions on a 9-grain sprouted organic bun. Served with sweet potato fries and spicy vegan cashew aioli. Vegan. Strict vegans please ask for whole wheat bread or ciabatta as sprouted buns have a small amount of honey. 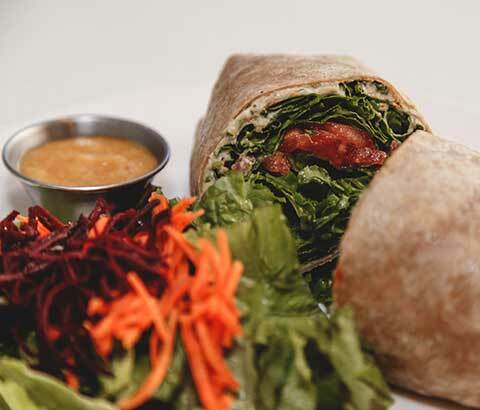 All wraps are served with either the garnish of the day or a small green salad with your choice of dressing: Lemon Tahini, Sesame Herb, Dijon Vinaigrette, Honey Mustard, Bleu Cheese, Olive Oil and Balsamic Vinegar. Our delicious curry of the day with brown rice in a whole wheat tortilla served with chutney. Most curries are vegan. Sauteed portobello mushrooms with roasted red bellpeppers, onions, garlic, fresh baby spinach and mozzarella cheese in a yellow chipotle tortilla. Vegan upon request. Fresh homemade hummus in a whole wheat tortilla with roasted red peppers, olives, lettuce, chopped cucumbers and tomatoes. Vegan. The ultimate vegetarian burrito: traditional tortilla with black beans, sharp cheddar cheese, brown rice, ranchero sauce, guacamole, sour cream, and salsa. Vegan upon request. Add spicy grilled veggie chicken, carne asada, or pollo verde (all soy based and vegan) for $3.00 more. Available from 11:00 A.M. to 3:00 P.M. Saturday and Sunday. We use organic, cage free eggs. Add a cup of soup or dal to any item for $4.95. Three eggs scrambled with your choice of ingredients from list at bottom. Comes with potatoes and toast. Add 2 stripples (soy bacon) for $2. 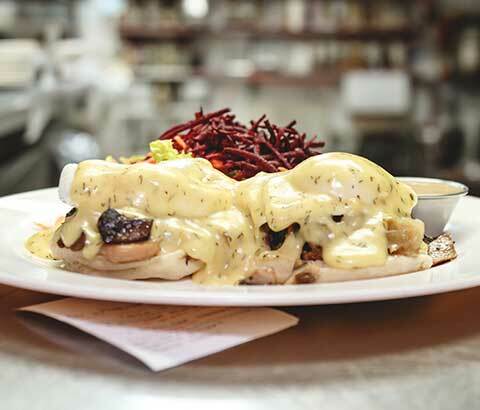 Two eggs poached and vegetarian sausage on an english muffin topped with Hollandaise sauce with potatoes. Our tofu scramble with your choice of flavoring from fillings listed below (inform your server no dairy) and served with potatoes and vegan whole wheat toast. Vegan. Two scrambled eggs with black beans, ranchero sauce, sharp cheddar cheese, guacamole, salsa, and sour cream wrapped in a tortilla. Served with potatoes. Vegan upon request (will come with scrambled tofu). Add (all soy based) spicy chicken, polo verde, carne asada or chorizo for $3. Two scrambled eggs on a bed of rice and beans on a corn tortilla topped with ranchero sauce, cheese, guacamole, salsa, and sour cream. Vegan upon request (will come with scrambled tofu). Add (all soy based) spicy chicken, polo verde, carne asada or chorizo for $3. Three fluffy pancakes with raspberry coulis and fresh raspberries served with pure maple syrup. Add 2 eggs or scrambled tofu for $2.50. Three vegan pancakes served with poached pear and vegan lemon curd together with pure maple syrup. Vegan. Add 2 eggs or scrambled tofu for $2.50. Three big pieces of french bread dipped in our orange batter with caramelized bananas, fresh strawberries, blueberries, raspberries, and glazed walnuts on top. Served with pure maple syrup. Three fluffy pieces of gluten-free banana pancakes topped with coconut yoghurt and toasted coconut chips. Served with pure maple syrup. Add 2 eggs or scrambled tofu for $2.50. Vegan. Thick slice of country bread with avocado, roma tomatoes, toasted pumpkin seeds. Vegan. Marinated kale, quinoa, cherry tomatoes, red onion, edamame, pumpkin seeds, and avocado with your choice of dressing. Vegan. Californian: Sundried tomatoes, artichokes, fresh basil, onions, and sharp cheddar cheese. Mexican: Cheese, with guacamole, salsa, and sour cream. Add (all soy based) spicy chicken, polo verde, carne asada or chorizo for $3. Greek: Spinach with spices, kalamata olives and feta cheese. Wild Mushroom: Wild mushrooms, caramalized onions, spices, white truffle oil, spinach, and goat cheese. Pesto: Fresh basil, garlic, and mozzarella cheese. Breaded vegetarian chicken nuggests served with homemade BBQ sauce. Corn chips with our home-made salsa and guacamole. Vegan. A yellow chipotle tortilla filled with sautéed portobello and melted cheese, with a side of salsa. Vegan upon request. Vegan cheese can be substituted for no additional charge. Corn chips, sharp cheddar cheese and black beans, topped with salsa, fresh guacamole, and sour cream. Two of your choice of either veggie carne asada, pollo verde, or portobello mushrooms on organic soft corn tortillas with beans and salsa. Vegan. Lemon Tahini, Sesame Herb, Dijon Vinaigrette, Honey Mustard, Bleu Cheese, Olive Oil and Balsamic Vinegar. Add grilled tofu, or veggie chicken chunks, carnitas, pollo verde, spicy chicken, or Thai chicken for $3 more. Red leaf lettuce with organic mixed greens, carrots, beets, cucumbers and your choice of dressing. Vegan. A mountain of red leaf lettuce with mixed organic greens, zucchini, carrots, beets, cucumbers, tomatoes, toasted sunflower seeds, and your choice of dressing. Vegan. Corn tortillas, black beans, brown rice, and ranchero sauce topped with red leaf lettuce, carrots, beets, sharp cheddar cheese, salsa, guacamole and sour cream. Served with your choice of dressing. Vegan upon request. Organic baby spinach, chopped tomatoes, cucumbers & red onions, kalamata olives, and crumbled feta cheese. Served with whole wheat flat bread. Choice of dressing. Vegan upon request. Sauteed zucchini, broccoli, carrots, mushrooms, beets, onions, and brown rice over a bed of red leaf lettuce. With bleu cheese or your choice of dressing. Vegan when you choose a vegan dressing. Marinated kale, croutons, veggie chicken breast, vegan parmesan, and vegan caesar dressing. Vegan. House-made soup of the day or our signature red lentil dal (spicy Indian lentil soup). Bowls of soup are served with a slice of whole wheat bread and butter on the side. Add a cup of soup or dal to any salad, sandwich, wrap or dinner entree order for $4.95 more. Add a cup of soup or dal or a dinner salad for just $4.95. The chef’s daily inspiration from international gourmet recipes. Check the homepage for today’s special. Many specials are vegan. Our specialty! A juicy loaf made from grains, eggs, ricotta cheese, tofu and spices blended together and baked, topped with a tangy tomato-based sauce. Served with mashed potatoes and mushroom gravy. Vegan upon request. Exciting Indian dishes from all regions. Not too spicy but full of flavor. Includes basmati rice, chutney, raita (a yogurt condiment) and naan bread. Check the homepage for today’s curry. Vegan option if the curry is vegan. Enjoy a complete meal of two samosas, basmati rice, chutney, raita, and naan bread. Vegan upon request. Organic chili pepper ravioli stuffed with artichokes, spinach, onions, spices, and covered with a zesty marinara sauce and served with two slices of toasted garlic bread. Vegan. A medley of carrots, zucchini, cauliflower, and broccoli served over brown rice with lemon butter sauce. Vegan when omitting the lemon butter sauce or substituting a vegan dressing. Add a dinner salad, or a cup of soup or dal for $3.95 more. Baked potato with sour cream, butter & scallions. Baked potato with mushrooms, broccoli, and onions. Vegan. Baked potato with curry of the day as topping. Many curries vegan. Our coffee is organic and fair trade. Our coffee and espresso is organic and fair trade. Made with lots of ice cream & topped with real whipped cream. Smoothie made with fresh fruit, apple juice & frozen berries. Our Marathoner with protein powder. Refreshing Indian smoothie made with yogurt, rose water, cardamom & sugar. Made with yogurt, mango pulp & sugar. Instantly soothing with a delicate Japanese flavor of green tea, toasted brown rice, buckwheat, and popped rice. We also try to include several selections daily that are gluten-free. We also have vanilla ice cream, and each day we feature a different flavor of Holy Gelato sorbet, gelato, and vegan gelato. Dessert menu changes weekly. Delicate flavors of cardamom and rosewater, traditional in Indian sweetsVegan. Our best selling, award winning cake. Vegan. Almond flavored cake overflowing with real almonds and coconut frosting. Vegan. A veritable taste of summer. Vegan. Single layer moist cake with pineapple. Vegan. Chocolate, peanut butter, corn flakes, and agave make this our best seller. Vegan. A favorite, this traditional recipe has been handed down through generations. Vegan. Great lemon flavor and pecans in each bite. Vegan. Please note this is the only non-vegan dessert item that we have. Choose any cake and a scoop of gelato or sorbet. We now also have vegan gelatos.